In 2013 the Miracle League built a new baseball field for handicapped kids to get the opportunity to play ball. They reached out into the community to ask for help. 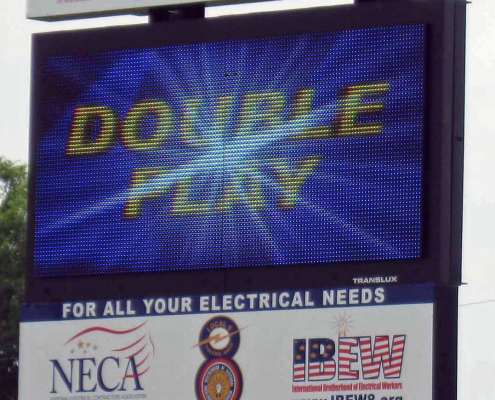 The Ohio/Michigan Chapter of NECA helped to pay for their programmable scoreboard and secured the voluntary labor to install and complete the project. We are proud to be a part of this community and take pride in giving back to the community that provides for us and our families. The director at the dedication said “I wish I could give you more recognition for all that you did to help make this project happen”. The dedication was done at the first games held on the new facilities and Association Director Todd Michaelsen told the director that “the smiles of the faces of the children playing ball today is truly payment in full”. 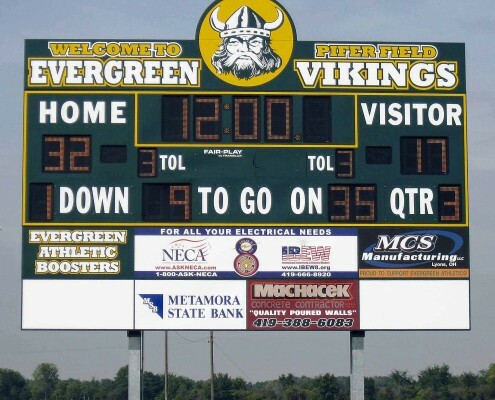 In 2013 the Ohio/Michigan Chapter helped pay for half of the costs for new programmable scoreboards to be installed at Oak Harbor High School and Evergreen High School. We do a majority of the electrical work in the area schools in our region and we felt that this was a good way to give something of real value back to the region and the local schools. Our schools are our future and they are struggling financially in these hard economic times. We are so pleased to be able to help these fine schools to upgrade their football scoreboards to new state of the art systems. NECA’s Premier Partner sponsorship program connects NECA members to the leading companies in the electrical construction industry.